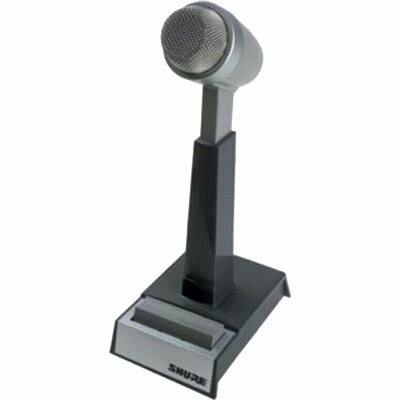 If you're looking for the perfect broadcast and paging systems microphone, you're looking for a Shure 522 dynamic base station microphone. This baby's built like a tank and ready for the long haul. Made of a high-impact ARMO-DUR base, the 522's all business. Its finger-tip control bar (that thing that keeps you from broadcasting embarrassing calls from your mother by accident) is made to get pushed over and over and over again for years and years. No cheap parts here. Plus, the 522's cardioid pattern keeps background noise and feedback down. And the Shure 522's switchable impedance output means it's ready for anything from radio communications to ancient intercom systems!